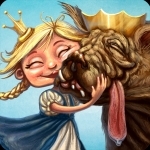 Can the ugliest dog in the land save the princess from becoming dragon dinner? Children at all ages are invited into this compelling and visual story, about friendship, bravery, anti-bullying – and a bony, drooling dog-like beast-thingy. Who’s actually very sweet. In his own way.